Some folks were talking recently about how good the Transformers: War For Cybertron game was, and how we need a GI Joe game that's up to the same high standard. There was a videogame based on Rise of Cobra, but it apparently sucked and sucked hard, so the sooner everyone forgets about that the better. Anyway, the discussion soon turned to what sort of game this hypothetical beast should be. Someone suggested a Marvel Ultimate Alliance-style game, where you have access to all the characters, but build mission specific teams. And yeah, I can see the appeal of that - everybody gets to play their favorite Joes, no matter how obscure they may be - but my problem was that Marvel superheroes offer something Joes don't: while the heroes offer a variety of super abilities, the Joes all share the same basic thing; firing guns. Low-Light might use a sniper rifle and Wild Bill uses six-shooters, but neither of them can teleport or summon lightning, you know? So my counter-suggestion? TF2 is a team-based FPS that was introduced Valve's "Orange Box"; you know, the same bundle that brought us such winners as Portal and Half-Life 2: Episode Two. It's not a complex game - two groups of players try to murder the hell out of each other in comical and entertaining ways - but it has a great art style and is really a blast to play. And I say that as someone who hates first-person perspective in games! I hate FPS the way Rustin hates... well, everything he touches. The youngest of eight boys from the south side of Boston, the Scout learned early how to solve problems with his fists. With seven older brothers on his side, fights tended to end before the runt of the litter could maneuver into punching distance, so the Scout trained himself to run. He ran everywhere, all the time, until he could beat his pack of mad dog siblings to the fray. The GI Joe equivalent: Snake-Eyes. Sure, scout's a loudmouth and Snakes is the Silent Master, but other than that the two line up pretty well. Incredible speed? It may not necessarily be about running around a battlefield, but would anybody really say Snake-Eyes isn't incredibly fast? And his agility would account for the Scout's double-jumping ability, too. Trade the Scout's baseball bat for an Arashikage sword, his gun for an Uzi and hey, why not, his pistol for throwing stars. The Cobra equivalent: Storm Shadow. Come on, you knew those two would end up being the same category. The GI Joe equivalent: Bazooka, naturally. Rocket launcher? Check. Not too bright? Check. What more could you need? The Cobra equivalent: Metal-Head. We could have just gone with the Cobra Bazooka Trooper, but I'm trying to stay away from "generic" guys. 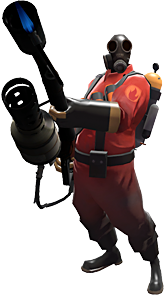 Only two things are known for sure about the mysterious Pyro: he sets things on fire and he doesn't speak. In fact, only the part about setting things on fire is undisputed. Some believe his occasional rasping wheeze may be an attempt to communicate through a mouth obstructed by a filter and attached to lungs ravaged by constant exposure to his asbestos-lined suit. Either way, he's a fearsome, inscrutable, on-fire Frankenstein of a man - if he even is a man. The GI Joe equivalent: Blowtorch. Why? Because screw you, Ice Cream Soldier, nobody likes you. He's covered head to toe, he's got air tanks, he's got a flamethrower... it's perfect! The Cobra equivalent: Sludge Viper. Yeah, okay, so much for no generics. Cobra doesn't really have a "flame" trooper (unless you want to count Torch), but this is an interesting parallel. He still has a self-contained suit and still squirts something really gross at his enemies - something that will continue to do damage over time, like the Pyro's flamethrower does. 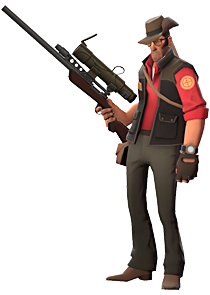 A fierce temper, a fascination with all things explosive, and a terrible plan to kill the Loch Ness Monster cost the 6-year-old Demoman his original set of adoptive parents. Later, at the Crypt Grammar School for Orphans near Ullapool in the Scottish Highlands, the boy's bomb-making skills improved dramatically. His disposition and total number of intact eyeballs, however, did not. 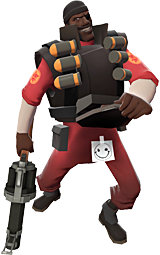 Word of his proficiency with explosives spread, and it was not long before Crypt Grammar received two visitors; the Demoman's real parents, who lovingly explained that all Demomen are abandoned at birth until their skills manifest themselves, a long-standing, cruel, and wholly unnecessary tradition among the Highland Demolition Men. His unhappy childhood had ended, but his training had just begun. The Cobra equivalent: Yeah, we're going with Cobra first this time because the choice is just so obvious: Firefly. He's the evil midnight bomber of the team, so he'd fill the slot nicely. If you don't know why, you don't know Firefly. The GI Joe equivalent: A much tougher decision, since the Joes don't really have a lot of crazy demolitions experts. But a black guy with a grenade launcher? That's Hardball! Like a hibernating bear, the Heavy appears to be a gentle giant. Also like a bear, confusing his deliberate, sleepy demeanor with gentleness will get you ripped limb from limb. Though he speaks simply and moves with an economy of energy that's often confused with napping, the Heavy isn't dumb; he's not your big friend and he generally wishes you'd just shut up before he has to make you shut up. The GI Joe equivalent: A big strong guy with a giant gun? Do you even need us to tell you this is going to be Roadblock? In the game, The Heavy even uses a lot of different food items, and Roadblock is a chef! You can't beat that! The Cobra equivalent: Cobra has a lot of big guys, but none of them use big guns - consider Big Boa and Road Pig, who may be huge but are still melee fighters. Instead, we'll go with the SAW-Viper, who may be smaller than the Heavy model, but definitely knows how to use the gun. The GI Joe equivalent: a week ago I wouldn't have known who to pick for this, but after reviewing Hi-Tech, there's no question he's the one. 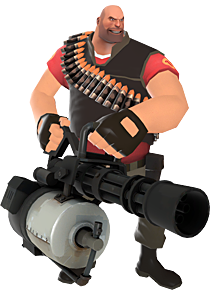 The Engineer's sentry turret features Gatling guns and a missile launcher - Hi-Tech's ridiculous accessory features the exact same things! Handy! Surely he could build a dispenser as well. The Cobra equivalent: Scrap-Iron seems ideal. His most famous accessory is a portable missile launcher, and since he hangs around Destro, he'd have access to MASS Device technology for his teleporters. What he lacks in compassion for the sick, respect for human dignity, and any sort of verifiable formal training in medicine, the Medic more than makes up for with a bottomless supply of giant needles and a trembling enthusiasm for plunging them into exposed flesh. 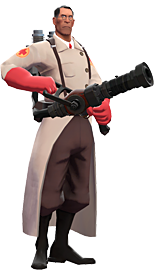 Raised in Stuttgart, Germany during an era when the Hippocratic oath had been downgraded to an optional Hippocratic suggestion, the Medic considers healing a generally unintended side effect of satisfying his own morbid curiosity. The Cobra equivalent: Scalpel isn't the only mad scientist Cobra has on the payroll, but he's the only one who's a medical guy - all the rest focus on psychological attacks or building robots or whatever. Scalpel is just the kind of guy to do the kind of stuff seen in the video above. The GI Joe equivalent: Doc? Maybe? Lifeline's a pacifist, so he's out. Stretcher uses crazy technology, so he might work. Dr. Link Talbot might be down for the mad science, too, but he's veterinarian. Which, upon further reflection, may work even better. The Cobra equivalent: Blackout. There are a couple others that would be good choices - Cobra Mortal looks cool, Gnawgahyde has the right kind of hat, etc. - but the prospect of having the Stall brothers face off is just too good to pass up. He is a puzzle, wrapped in an enigma, shrouded in riddles, lovingly sprinkled with intrigue, express mailed to Mystery, Alaska, and LOOK OUT BEHIND YOU! but it is too late. You're dead. For he is the Spy - globetrotting rogue, lady killer (metaphorically) and mankiller (for real). The Cobra equivalent: Fun fact - my first thought upon coming up with the idea for GI Joe-branded Team Fortress 2 was that the spies would be Snake-Eyes and Storm Shadow. But come on, a guy who turns invisible, is a cowardly assassin and can look like anyone? It's Zartan! The GI Joe equivalent: Lady Jaye? She was the team's master mistress of disguise decades before Agent Faces came on the scene, and if I were to choose him it would only be because he was a man. Lady Jaye fits the Spy profile much better. And his cigarettes would explain her voice. So, those are my choices. Throw some new Joe-themed skins on the levels (like making Turbine into the engine room of the USS Flagg or Fastlane into Springfield, whatever) and I would play the hell out of that game. 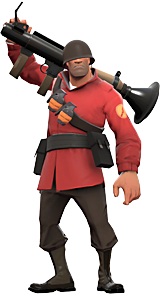 And knowing how crazy the Team Fortress 2 players are for buying hats and other things, you could milk them for alternate costumes or even alternate characters. Turn Snake-Eyes into Jinx. Turn Firefly into Monkeywrench, even. Like I said, most of the GI Joe characters have an overlap, so finding replacements and stand-ins wouldn't be impossible, and thus you'd still have people able to play as their favorites.